From our Lead Councillor’s response to our concern I feel uncomfortable with Reading Borough Council’s strategy on Climate Change. It is a thin response and requires anyone with climate competence to step up and deliver a proper and adequate response to why the two reports below from Strategic Environment, Planning & Transport Committee 23-NOV-2016 are not effectively engaging with current risks and are simply disengaged from their core task? Especially with regards to all committee meetings since 4th November! NB: The Paris Agreement was formalised on the 18th December 2015. It has entered force on the 4th November 2016 and is now bound into Law of Treaty. The UK government ratified the agreement on the 18th November 2016. A signed copy has been delivered to the Reading Borough Council. Vision – suggested ECO4CLIM_Rdg Climate, Innovation +Jobs Draft Strategy w/ target: Urban eco-philosophy will, in a few years, develop 50 labs across the world / empower more than 500 urban ecopreneurs / generate 3,000 green jobs and directly avoid hundreds of tons of CO2 emissions into the atmosphere. Urbanisation and industrialisation has gradually led people away from living in natural environment depriving them of the health benefits of nature such as natural light, green views, local biodiversity, and natural landscapes. Anyone can, contribute to a sustainable and resilient city structure as long they stay within to the city’s territorial boundaries and do not trespass it’s surrounding greenbelt. If new land is taken for development the case is lost. A healthy environment is based on healthy (100% clean) quality levels in soil, water and air, this is ecology. A healthy social environment (society) is based on fundamental humane values (all living beings included) wholesome eating, living and interaction. The following eight videos will explain most of it, what you are missing you can Google. Over a hundred advanced Conventions, Treaties, Agreements and Frameworks have been globally agreed and put in place during 2016. We decided to take a look at a handful of simpler declarations, of thousands of papers, policies, guidelines and text documents. How can resilient cities buy us time to secure and safeguard our habitats against coming superstorms? Based on the fact that everything is connected, how do we know which pathways to follow? The way forward is lasting habitats CO2lutions* enhancing Garden or Wildlife Cities, car free with underground density functions where all of us take on a purpose driven keepers role. These spatial urban aerial habitats are disaster response ready of course. * We also need to undertake a work programme under the CP21/New Urban Agenda framework for SDG11 + SDG5 approaches to sustainable safe development with the objective of considering how to enhance linkages and create synergy between, inter alia, mitigation, adaptation, finance, technology transfer and capacity-building, and how to facilitate the implementation and coordination of SDG11 + SDG5 approaches. Enclosed our initial, #ECO4CLIM_Rdg “draft strategy outcome document 31 October 2016” from the first Ecopreneurs meeting in Reading. We hope that Reading and its stakeholders will commit to a zero emissions vision together with “green” companies acting as an economic engine for the region. Climate Change Centre Reading focus on how to reduce cities emissions as quickly as possible. More and more cities set net zero targets between 2040 and 2050. The question is no more when or how much, only how. It has been a remarkable year with all treaties and agreements, conventions and declarations coming in place being agreed globally. With a staggering incredible development of daily new energy CO2lutions and Climate Innovations, with ongoing new climate preparedness worldwide, we believe local emissions reductions could happen much faster aided by leaders that are committed to taking the crucial right decisions. It is the local government and its stakeholder responsibility to implement zero targets decisions. As the planet is warming and more and more refugees of food shortage are seeking urban shelter for protection, demanding right to protection, cities need not only adequate housing but adequate climate housing. The cradle of life is ecology, climate innovation for urban growth is where one can have most impact to improve soil, water and air quality for all (Permaculture principles and the unnecessary principle). What is needed is reservation, sustainable use and restoration of ecosystems and biodiversity, with the dual objective of mitigating climate change and adapting Reading region to its effects. It is essential to reduce the human footprint whilst the planet’s population is growing. Target: Thanks to partnerships and companies’ generous contributions this eco-campaign will, in a few years, develop 50 labs across the world / empower more than 500 ecopreneurs / generate 3,000 green jobs and directly avoid hundreds of tons of CO2 emissions into the atmosphere. 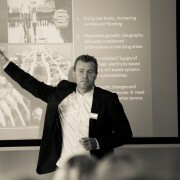 As the Ecopreneurs of Reading we would like to connect new climate innovation with green business. In the name of Ecopreneurs” green entrepreneurs” US are forming a British Wing (Bat) Flap for climate CO2lutions with the aim to reduce release of carbon dioxide CO2 and other toxic Greenhouse gases and prevent 100’ tonnage from leaking out in to the Greenhouse gas area causing further warming. Suggested Innovation: Shadow Local Government to voice the people’s sustainable initiatives and create a balance between general stakeholders like business, organisations and academia. “Bridge the gap” to achieve the best possible democratic outcome for the benefit of sustainability, quality of life and long term health indicators. “Ecopreneurs for the Climate” is rooted on the leadership of its climate organisers, working at the intersection of business and civil society in their communities; the extensive support provided by its sustainable business networks; and the wide reach of its global partners, including Impact Hub, SwitchMed, Green Shift Africa, Ecopreneur.eu, GreenEcoNet, and the NESI Forum. Empower the local government to create an inclusive accessible city (social inclusion and access to water, sanitation or electricity in high-risk areas) and shared development in accordance with the New Urban Agenda, the UN Habitat III framework. Implement new strategies to meet the sustainable development goals. One city area dedicated to a Net Zero district, a green city showcase area. “Improve our understanding of climate risks and opportunities for innovation. Air Quality up to WHO standards. Existing armed forces and military reserves become a stakeholder in joint partnership with the civil society and local authorities. Reading Garden City with Green Roofs, Shaded Biodiversity Zones, Wildlife Corridors, Incredible Edibles and the right to an allotment for every household. Comprehensive air-ship docking connectors to Tram/Podcar/Monorail Network “Garden Balloon” for regional transport, heavy duty and tourism. Fully developed Climatic Emergency Evacuation Response Programme with specifically designed multi-functional usage protection zones against floods and superstorms, with capacity for 50-100:000 people. Ecopreneurs for the climate” was held on 28 October in the Oakwood Centre. With the celebration of this event, Reading joined “the Global Week Green Economy and Climate Movement” which was held in 24 cities around the world, from Barcelona to Tokyo to Santiago de Chile. The first part a “LABoratory of Innovation Climate”, will be dedicated to the diagnosis and analysis of climate problems facing Reading, connecting the dots. The second part will consist of the delivery of the “Climate Champions Awards” at the next Climate LAB of end of March singling out sustainable projects. The awards will be divided into two categories: one for established companies and a second, for entrepreneurs with projects still undeveloped. A jury and the public attending the conference will facilitate the prizes. This is going live in the U.K. in October 28th! Whether you are a student or an Ecopreneur, whether you are a free-lancer or work in an SME, or even in a large company, as long as you believe change is possible; our contribution makes a true difference for the people and the planet. This is your movement – Inclusive, diverse, fun and transformative. Your generous contribution to this campaign will, in a few years, develop 50 labs across the world / empower more than 500 ecopreneurs / generate 3,000 green jobs and directly avoid hundreds of tons of CO2 emissions into the atmosphere. Looking to unlock Reading’s green potential. We will, in three weeks, seek to locate and highlight eight local climate innovations (Eco-preneurs)! 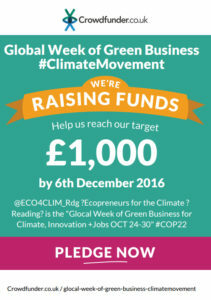 Do not hesitate to put forward to us yours or any local low-carbon Innovation that can reduce Reading’s Greenhouse gas emissions footprint! We warmly welcome you to participate in the ECO4CLIM_Rdg Event – Climate, Innovation +Jobs “Glocal Week of Green Business and the #ClimateMovement” Friday 28th October. The Swedish government wants to introduce a law that primarily affects 2,000 major Swedish companies to implement a sustainability report. If it goes through it shall enter into force on 1 July 2016. The Act is based on an EU directive in September 2014. Many believe that the current voluntary sustainability reports deemed to be superficial reports designed to keep the company’s stakeholders in a good mood for sustainability. Some representatives believe that the new law can serve as a decision-making model and thus an effective management tool. What we know about the law are among others companies to explain how they work with a range of sustainability issues. Current areas to be considered are environmental issues, social issues, issues regarding employment such as work environment, respect for human rights, anti-corruption and bribery. Description of the diversity policy apply to the company’s board. The goal of the policy and how the policy has been applied and the result of the policy’s implementation. If the company does not apply any diversity policy, the reasons for it noted. Applies only company in the last 2 years, met more than one of the conditions for “big business”. This bill defines “large companies” of companies that meet at least two of the following conditions. The average number of employees in the company amounts to more than 250 pieces. Total assets will amount to more than 175 million (20 million) or net sales amounted to more than 350 million (40 million euros). Enterprises of “public interest” is likely to include listed companies, insurance companies and credit institutions Even companies with “social-bearing activity” can be covered and can be comprised of electric utility or other activities in infrastructure and in health care. Advantages of a sustainability may be that the company has an in-depth dialogue with all stakeholders and understanding of the challenges. Good survey of sustainability activities and the risks and opportunities. More benefits are to involve management in sustainability efforts. Auditor should verify that the non-financial report has been submitted. No claim today that the report must be certified. Last but not least, your brand is affected positively by sustainable business. Maybe we dare say that a sustainable business gives your business even more good years on the market. Will the president of the European Union ban private cars in the urban environment? Many people and community groups in transition are positive to this and want to ban private cars in city centres, so the streets will be safer and there will be less damaging pollution. If all the private cars disappear, there are big plans for how all the space currently taken up by cars can be used for something better with the aim of making much needed urban behavioural change happen. How do we allocate and transform public street space in cities and towns into public spaces? 2016 is the time for a more radical approach to end fossil fuels. Our aim is to ban private cars from town/city centres and reallocate road space to active travel such as walking and cycling to reduce congestion and address the damaging health impacts of air pollution, inactivity and obesity. Also, if all private cars were banned 12 days a year would be equal to 12 out of 365 days decrease in world private vehicle gas, petrol and diesel consumption ~ 3%! Many of us grew up cycling in the countryside when there were very few cars on the road and have never owned a car. We saw cars as the future, more people = more cars (less air quality), in a limited space, how is this going to work? Each new road erases the natural world and we believe we have a duty to respect our natural environment. We have not always been sensitive to the damage car culture has on society and our environment. We do not accept that people are killed from air pollution; road casualties, inactivity and obesity are the price we have to pay or collateral damage. There is a need to establish a platform of decision makers who acknowledge we have all the tools to achieve, implement and conduct. We have support from businesses, even corporations can cope with one CFD per month. 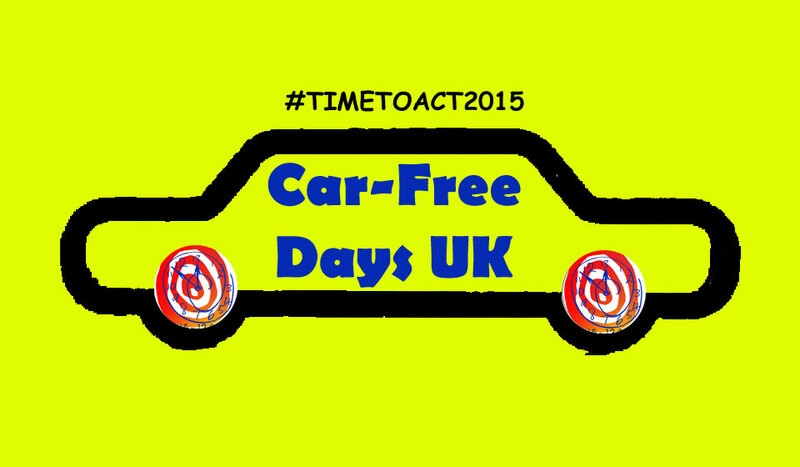 If we can agree to one year of monthly car-free event then we can also tackle the need for radical behaviour change. Great work has been done with Ken Livingstone’s congestion charge initiative in London but over time it clearly has not worked. 2016 is the time for a more radical approach. Road charging has some benefits but if you raise the charge to the eye watering amounts required to clear traffic, you will end up with just the wealthy able to drive cars in cities. This is already statistically the case and we believe not good for social cohesion. The next stage is to ban private cars in city centres and free up public street space for walking and cycling, the great equalisers. Ban of cars in all of city centres or just parts of the city? E.g. London – The 2011 census marked a tipping point in car ownership in Central London. The majority of households for instance in Westminster (63%) The City (69%) Islington (65%) do not own a car. Car owning households in Central London were now the minority. Finally there was a political opportunity to make the case for a car free London in zones 1 & 2. The picture is different in the outer boroughs where public transport is not as concentrated and journey distance to the centre is longer. Here car ownership is still in the majority. The project Monthly Car-Free Work-Day Planet does not advocate the banning of public transport and commercial vehicles as they are essential to running the new economy and maintaining the city services. However we do want these modes rationalised, reduced in number and upgraded to the cleanest models available. Costs and availability of licenses would be based on lowest pollution and environmental footprint and whether the license was deemed to be necessary. All vehicles would have to be diesel free and with low emissions. All paved tarmac and stone surfaces would be examined with a view to increasing the green areas and thus air conditioning/micro climate control. Owning a private car however is not a necessity and private electric cars and scooters don’t address the underlying problems of congestion, road casualties, inactivity and obesity. Clean tech cars may pollute less (silent oil spills!) in the direct environment but the electric grid is only 19% renewables and still polluting elsewhere whether coal and gas emissions or nuclear waste. E waste from Electric vehicle batteries en masse would present a new challenge for toxic waste and the batteries are very expensive to recycle. Unfortunately diesel will have to be crushed, a very bad mistake and all who bought into or promoted the switch to diesel will have learnt a difficult lesson, unless diesel cars can be recycled into bikes? Cleaner models will have some resale value. Perhaps possible to incentivise people to ditch their diesel immediately and join an electric car club or receive a bike. It is also important to make active travel and public transport as accessible and inclusive as possible for people with disabilities and older people. Active travel benefits a wide range of people; customised cycling bikes promoted by, for instance, Wheels for Wellbeing give a variety of options for many people with disabilities, including hand cycling and assisted. Being socially inclusive creates a society that is more cohesive. Making space on the roads for a quality, safe, inclusive cycling experience is paramount. Whether that is protected lanes, filtered permeable or active travel corridors (whole roads for bikes) is down to what works best in each location. It also occurred to us that freeing up vast amounts of space used for parking private cars (6.8 million parking spaces in London use up 78.5 km sq, based on minimum parking space) could unlock car parks as brownfield sites for key worker housing, at reasonable rents, linked to their jobs in the vicinity (linked to commuting). A good idea would also be to plant more trees on previously car lined streets. Hopefully we could move fast to ban private diesel in Central London, one years notice; 9500 deaths per year requires a proportionate response. How to implement a one year trial for a regular Car-free Day on a Workday worldwide? Logistically this is radical change. The city would not be able to build cycling protected lanes on main roads fast enough, but road closures of rat runs as alternative car free cycle routes could be implemented within the time frame and space saved would allow local agriculture to grow urban farming. If you are not a car owner you mostly walk in London, with the odd bus and tube for longer journeys. Occasionally you may cycle using a Boris bike or on a friend’s tandem, but as part of the majority that feels very uncomfortable cycling in London with congested streets, mixing with large HGVs and buses and very poor cycling infrastructure. People would love to cycle more, yet Londoners live in very small flats so are on the lookout for somewhere practical to park and ride, maybe a folding bike or with a basket, or even a cargo bike combined with safe parking! Trains are the way forward for longer internal journeys in the UK and we would like to see more investment, more incentives and ultimately prefer railways to be nationalised for the good of the nation rather than for profit. Londoners travel by train mostly out of London. Bike provision on trains is an issue and one that needs addressing. Inhabitants of London occasionally catch a lift or use taxis where there is little or no public transport provision. There is general sympathy with the ideal that public transport should be a basic human right, but it is difficult in very rural areas. Sharing taxis might provide a more flexible option than buses. The idea of connecting urban areas with dedicated cycle lanes like the proposed HS2 for bikes is very likable. What should happen to cars outside London? Outside London we believe the banning of private cars in city centres and banning diesel are important for the health of the urban environment. Prioritising demotorisation and active travel is the way forward for the 21st century. Nearly half of commuters in the UK live less than 5 miles from their work, an easy distance to cycle. These journeys must be made safe and inclusive to encourage as many people as possible to choose cycling as the healthy option. In the London outer boroughs, 66% of journeys under a mile are made by car. We are doing something very wrong if it is easier/ more comfortable/cheaper for someone to take the car rather than cycle or walk under one mile. Cars should never work out cheaper than public transport so taxing car use through fuel or road usage or road tax are all options and ploughing that back into public transport and active travel infrastructure. Residents parking permits need to be at least £1,000 per year (Southampton Central charges) to represent their cost to the public highway. Currently most people are living in urban environments, but for those who live in rural areas it is far more difficult to ban private cars. Sharing taxis may provide a more flexible option than bus routes. There may be long term solutions that can’t be conceived of yet, but if we do maintain some presence of private cars it needs to be done with respect for other road users and we believe presumed liability enshrined in UK law would be the most efficient way of ensuring that. Fantastic global networks of Climate Action, Urban Thinkers, City Planners, Global bikers, Changemakers, Youth forums, Transport Think Thanks etc. 50+ Nations are developing car-free districts in urban areas. Yes there is a worldwide movement to go car free in Cities that includes politicians and grass roots campaigners, From Al Gore to Richard Branson and even perhaps more unexpectedly Jeremy Clarkson who said ‘Get rid of your car, you don’t need it’ in a recent Sunday Times article. We have the connections to bridge the project and collect 2 million signatures together with organisational support. Highlighting the third Wednesday of every month through the year as Planet´s Monthly Car-Free Work-Days, 20/5, 17/6, 15/7 etc. Transport and in particular private cars are one of the fastest growing contributors to CO2 emissions. Some predict that 1 billion cars today will rise to 2 billion by 2020. It is crucial and pressing that we curb this rise in car use as well as addressing other contributing factors. Cycling and walking are vital to transforming not just our cities but also our planet. Sharing and mixed use of a human caused economy – where we share as much as possible, from our whole infrastructure to jobs, this happens in the Anthropocene room between public space and cyberspace. Togethernessship – All about inspiration and agreement, being truly inclusive and Safeguarding the future. The complex nature of our environment makes it hard to focus on preventing GreenHouse Gases, which are directly related to global warming. The downside of the problem is that everything is interlinked and needs to be backtracked http://en.wikipedia.org/wiki/Backcasting, but we have the time scale which is rapidly shrinking, so an agreement at #COP21 in Paris, in December is probably a must. “Monthly Car-Free Work-Day in the UK”. Following the Deep Decarbonisation route set out for a successful climate agreement in Paris at COP21, CCCRdg hope the National Climate March, London on Saturday 7th will stake out actions necessary to divest from dirty energy that not only adds to already high greenhouse levels but also pollutes the air, our common realm, which directly and utterly affects our health. The right thing to do in order to comply with changing to zero carbon fuels is to slow down our “business as usual” (BAS) behaviour. With a regular Car-Free Work-Day, can UK take a lead on behaviour change divesting away from fossil fuels? That is the question. The People’s Climate March last September was huge. With around 40,000 people marching in London, 400,000 in New York and many thousands more taking part across the world, together we made history. 2015 needs to be even bigger. The climate talks in Paris this December are crucial if we’re going to protect all that we love. Our movement is growing, and we’re more diverse and determined than ever before. Across the UK people are already building change – from divestment of funds which prop up the fossil fuel industry, to front-line communities fighting unsustainable energy extraction and fracking, through to those paving the way for a transition towards a 100% renewable energy future which would bring about an estimated one million new climate jobs in the UK alone. Meet the CAR-FREE WORK-DAY BLOC on the 7th March to make the link between climate change and switching to zero carbon fuels. Put the climate on the agenda ahead of the 2015 General Elections and the December 2015 Paris United Nations COP21 climate talks. Let´s work together to help achieve this, it will be an important step in solving and laying a just and fair developing pathway, switching to zero carbon fuels.